The reduction of emissions and the increase of efficiency play an important role in the field of plant engineering and mechanical engineering. Our skilled engineers provide through CFD simulations efficient and solution-driven proposals for optimizations. Projects from the branches wind power, hydro power, compressors and energy storage technology are exemplary described here. Flow simulations are an essential part of the development and planning of wind turbines. With Computational Fluid Dynamics airfoil evaluations can be undertaken and the most efficient solution can be found. The design and the development of the rotor blades are accelerated and eased through CFD simulations and the important optimum pitch angle is determined through User Defined Function Programming to increase the efficiency. The calculation of performance, efficiency or torque is simplified through flow simulations and expensive and complex tests are not necessary, because of the realistic results from the flow simulations. With CFD simulations whole wind-farm scenarios can be evaluated to calculate the ideal use of the available area as well as to avoid slipstreams. Additional aerodynamic optimizations can be achieved through bionic, aerodynamic effective surfaces. Further information are found under the category “Riblet Surfaces”. The reduction of noise emissions is also in our field of competence. You can find more details under the category “Acoustics”. In hydrodynamic power there is a potential for optimizations on existing systems as well as on newly developed systems. With the help of flow simulations it is possible to calculate the system effectiveness and further optimize it. Additionally every relevant part of the power plant can be evaluated. This can be the reach of a river, banks, barrages or the approach flow of the turbine. The CFD based detailed planning helps with the calculation and optimization of ideal turbine vanes, hydraulic drag or mass flow rate. Multiphase models like cavitation, suspension or abrasion can be simulated and contribute to realistic results. Through CFD simulations maintenance time can be shortened and wastage optimized. Computational Fluid Dynamics are also used in calculations with compressors. Periodic simulations of compressor blades are made to conduct efficient and cost-efficient model studies. Dimensioning of the spiral housing and flow analysis are possible as well as calculations of performance maps. With the help of computational fluid dynamics the noise emission and the sound pressure level are calculated and so a statement about the noise development in the first place can be made. Consequently the whole compressor can be analyzed and optimized with flow simulations. Fluidic optimizations help to improve efficiency and to reduce emissions in the engineering of power plants. 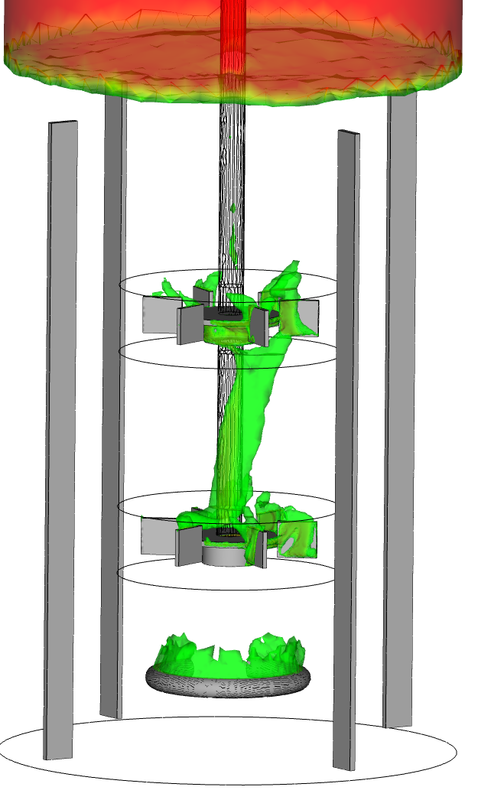 Through Computational Fluid Dynamics existing power plants are analyzed and potential of optimization becomes apparent. Projects in the field of thermal management like cooling systems, the use of waste heat or modelling of combustion processes are calculated with flow simulations and successfully solved. Furthermore a reduction of the water consumption, row material charge and emissions can be achieved through numerical flow simulations. The visualization of streams inside of a power plant enables a better basic understanding of the cycles in the plant. Moreover development time, complicated tests and further costs can be reduced by the use of CFD calculations. Another field of competence is the optimization of filter systems. The use of multiphase models helps to simulate the distribution of flue gas, particles and droplets and so the whole filter system can be improved. For a more detailed information about Computational Fluid Dynamics procedures for your application feel free to contact us!